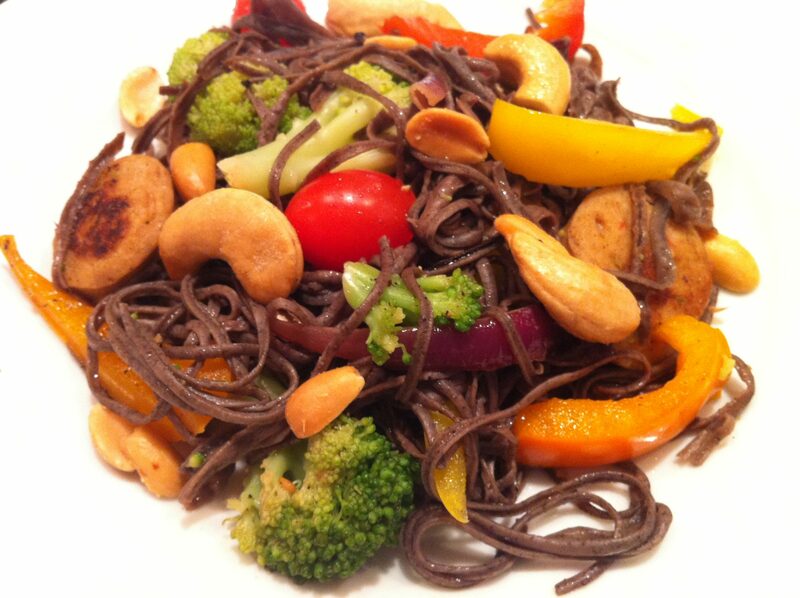 Have you ever heard of black bean spaghetti? My sister-in-law noticed it last year and picked up a package for me, knowing I’d be intrigued. I had no expectations and was dubious that the kids–or even the parents!–would like it. To my surprise, it was a hit all around and everyone looks forward to this meal. In fact, tonight during dinner, my 10-year-old was marveling out how he REALLY doesn’t like black beans, but he just LOVES this spaghetti. For the record, it is made of 100% black beans, so it is an excellent gluten-free option. It is also packed with protein and minerals, unlike most pastas. I think the pasta would be equally excellent topped with a marinara sauce. However, every time I prepare the black spaghetti, as we call it, I go the stir-fry route since we all enjoy that version so much. I typically omit any meat, although this time I included some chicken sausage, and everyone gave that addition a thumbs up. Recently, we were having this for leftovers and my younger son asked if his friend could stay for dinner. I said “sure!” but provided the disclaimer that dinner was leftover black spaghetti, thinking that information might scare him right back to his house for dinner. Our nine-year-old friend proved to be most adventurous and cleaned his plate. He later told his mom that she really had to buy black spaghetti…which she did! Cook black bean spaghetti according to package directions, adding broccoli florets in the last two or three minutes just to blanch. Drain, rinse, and drain again. In a large skillet over medium-high heat, brown sausage then remove to a plate. Saute onion until starting to brown and soften, then add peppers and saute a minute or two until slightly cooked but still quite crisp. Stir in sausage, spaghetti, broccoli, tomatoes, and a generous sprinkle of salt and pepper. Drizzle with 1/4 cup of the dressing. Toss lightly to distribute dressing and all of the components. Garnish with nuts or seeds and serve with additional dressing, if desired. Mix all ingredients together and store in a jar in the refrigerator. Will keep for a week or so and can also be used as a chicken marinade. In lieu of dressing, you may drizzle with olive oil or sesame oil and soy sauce. Since the spaghetti is made of black beans only, I think it does require a bit of salt or soy sauce. I experimented with the following dressing this time but typically just give it a bit of oil and some soy sauce. A store-bought Asian dressing of your liking would be wonderful, too. BBQ chickpea burgers sound delish…like a fun spin on falafel! Yum! Just made this tonight. Total keeper! We pretty much demolished it in one sitting. My only tweaks were just out of necessity. I had all the ingredients except the black bean noodles. Went to the market and all they had were edamame noodles so I used those. I went ahead and tossed some cashews in there to cook ’em just a smidge. The Ginger-Soy dressing makes this dish an out of the ball park meal! Thanks for posting! Great news, Tracy. So glad it was a hit! I haven’t tried edamame noodles yet, although I’ve seen them. Perhaps it’s time to try! A keeper! Googled black bean pasta recipes after seeing it in the market. Found your recipe and though I’d try it. Even the kids loved this dish. The dressing is perfect. That’s terrific, Denisse! I almost always have a package of this on hand because it’s so easy (and healthy) to use in stir-frys, and I always marvel at how much everyone likes it! Hey – thanks — nice recipe — I made it — it was delicious. im vegan so I just added cubes of tofu. My pleasure, Denise. I’m thrilled it was a success!